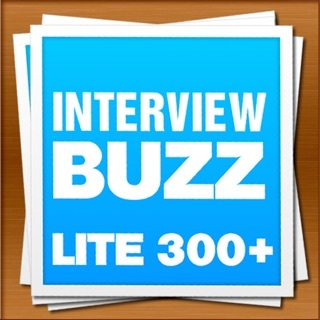 Interviews are nerve-wracking! We think to ourselves…What questions will they ask? Do I have the skills they’re looking for? Will I make a good impression? This affects self-confidence, and we can sometimes undersell ourselves. Interview Prep has everything you need to Be prepared, Be confident, Be Successful. 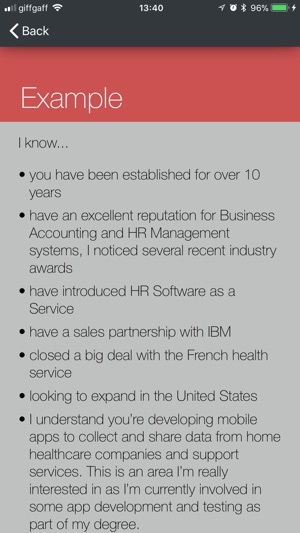 • All the key interview questions with hints, tips and plenty of examples for each question. • Role-specific questions for apprenticeships: business admin, HR, finance; arts, media, publishing; food & beverage; hairdressing & beauty; health & social care; leisure, travel, tourism; engineering & manufacturing; sports, outdoors; trades, electrical, motor; construction, planning; retail; science & mathematics; transport & logistics; ICT/tech; sales & marketing, digital social media. • Advice on writing applications, face to face interviews and group assessments. • Personalise and store your response within the app - with your own examples or use ours. 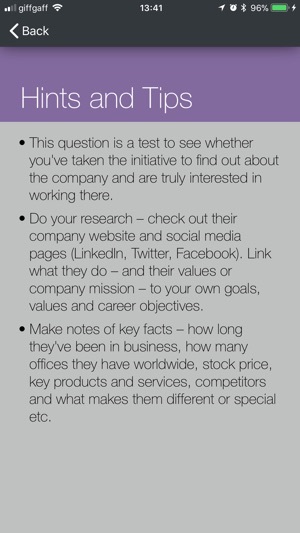 - Companies or people you’re researching or interviewing with. - Skills, achievements, references, contacts, etc. 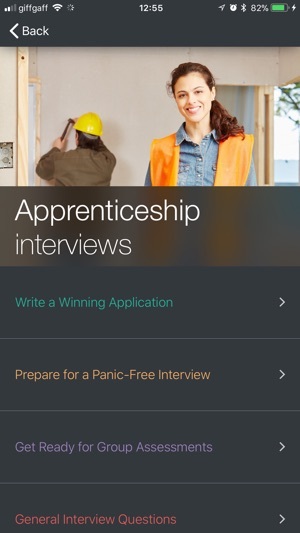 • Interview Prep App is faster and more effective than a gazillion Google searches or downloading pdfs. 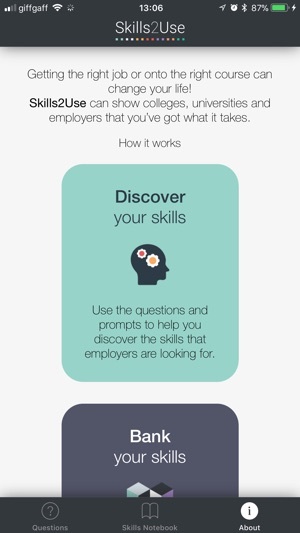 • Everything you need to prepare a job search campaign or for last minute preparation on the way to the interview. • Regular additional content through our Facebook Chatbot, including additional examples and ways to discover employability skills from sports, clubs, hobbies and academic work. 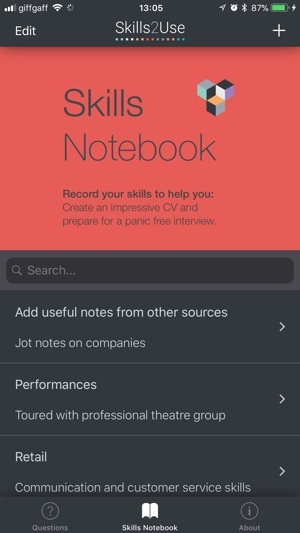 Interview Prep works on both iPhone and iPad and syncs seamlessly across your devices via iCloud. This means you can write your answers on your iPad at home and do some last minute cramming on your phone before the interview. 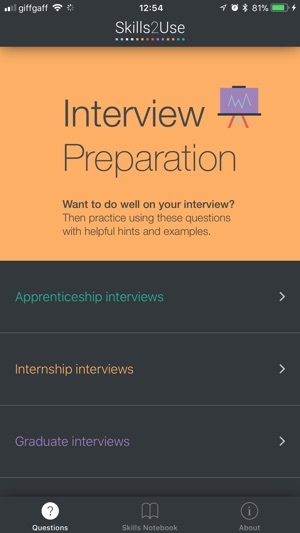 For best results use Interview Prep with iCloud. Your privacy is important to us and data is stored only on your own device and iCloud account. Good luck with that interview! We've made it even easier to find your answers to your questions. Now you can search for them and modify them in the Answers tab, the second tab in from the left. You can also search your answers and questions to get strait to the answer you needed. We've also made numerous improvements and bug-fixes to make the user experience smoother and more enjoyable. We hope you like this version but if you do experience a bug, feel free to contact us and let us know. Ok, so I wasn’t sure when I first downloaded. I’m not a confident person and don’t generally do well at interview. Answered all the questions and went back to add extra info as I thought about it. Followed the tips. The skills notebook was handy for just scribbling stuff down and doing a brain dump. Long story short, I read my answers and skills on my phone on the bus to the interview and this helped me remember and I actually got the job, which I wasn’t expecting actually! The questions they asked weren’t exactly the ones in the app but I was able to use the same answers and just the process of going through the answers beforehand meant I wasn’t left thinking of what to say. I’ll definitely use this again.